Hi Friends ! Today i am going to build a simple Calculator application using C# in Visual studio 2010 /2012.I will create a setup file(.exe file)of this application in visual studio 2010/2012.But i Will show you "How to create setup file in visual studio 2012 'only .Because I have already explained "How to create setup file in visual studio 20008/2010" in our previous tutorial. Some students want to create setup file in visual studio 2012.So in this post i will create a setup file using visual studio 2012 .In visual studio 2012 Ultimate has some limited functionality to create setup file in best way. all students mostly use Demo version of visual studio that has a limited functionality.Visual studio 2012 is the enhancement (some Updation) of Visual studio 2010.So i would like to say you,use visual studio 20008/2010 for creating a effective setup file and other purpose use visual studio 2012.You can receive both visual studio setup file through Bottom Download link .You can check yourself which is more better.You can install this setup file in your Window xp/Vista/7 /8 easily and use it for your calculation purpose.I hope this application will more helpful to you/Friends and your clients. 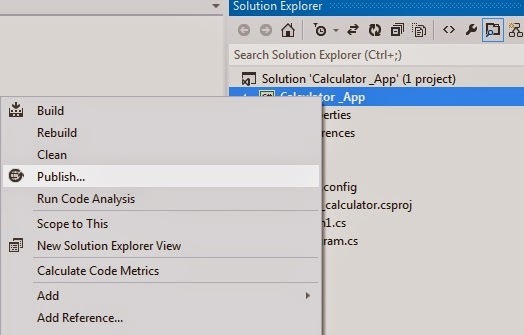 Step 1:- First Open Your visual studio-->File -->New -->project -->Select Windows Forms Application -->OK-->Open Solution Explorer (by press View Button) -->Add a New Web Form. Note :- You have to put all Numeric button to under Numeric_button_click event, similarly put other button also. 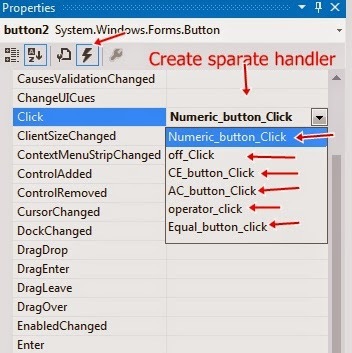 Here I have putted all numeric button such as 0,1,2,3,4,5,6,7,8, . in Numeric_button_click Event Handler section.So You have to go each numeric Button's properties -->Events --> Set Click =Numeric_button_Click. Here i have putted Operator button such as +,-,*,/ in operator_button_Click Event Handler-->So go each operator Button's properties -->Events --> Set Click =operator_button_Click. Similarly others also putted in respective event handlers,You can see it in above c# coding. Now i am going to create a setup file of above application in visual studio 2010 and 2012 both.But i will show you "How to create setup file in visual studio 2012"only.Because i have already created setup file in visual studio 2010 so you have to follow same setup from here. Step 4 :- Now you can select corresponding Radio Button if you want to receive update alert or not of your setup as shown below -->Press Finish Button -->Done. 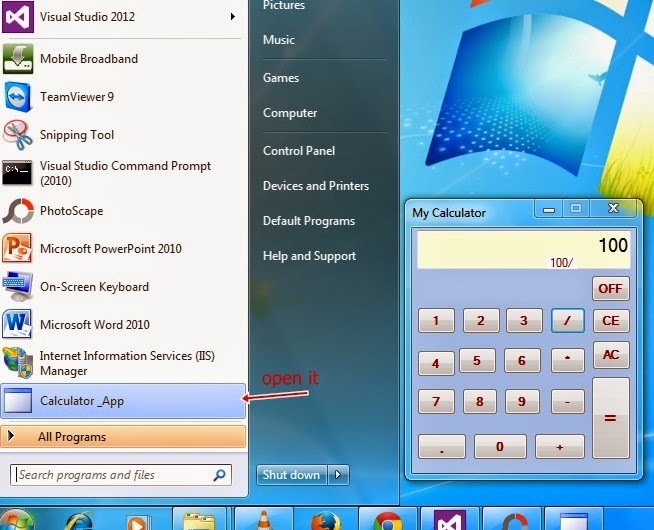 In this Post I have create two different setup file for this Calculator application.You can download it from the below link. If you are using window xp/vista /7 then you will required .Net Framework 4.5.You can download it from here and install it on your system. Otherwise setup automatically download this framework when you will install it. If you are using window 8 then you will not required this framework because it is already installed. Please share this post with your friends if this is helpful for you.If any problem comment it.